The Ulisse Dining is a queen wall bed with a functional dining table or study desk attached. By day the unit is a comfortable 4-person dining table or large study desk. 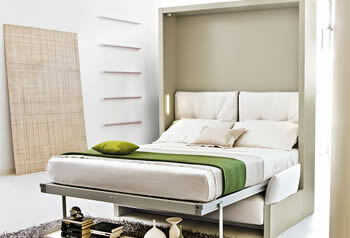 By night the unit transforms into a comfortable queen bed, with the table folding neatly underneath. Also available as a plain unit (no table), with desk or sofa.